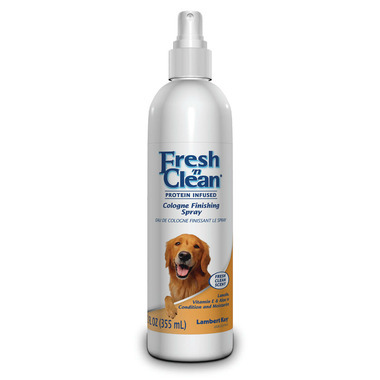 Fresh n Clean Cologne Finishing Sprays moisturize skin and coat with vitamin E and aloe vera. Contain lanolin to lubricate skin and coat after or between baths for easy comb through and protein to strengthen, repair and protect coats. Available in Fresh Clean, Tropical, and Baby Powder Scents. Lanolin lubricates skin and coat for easy comb through. Moisturizes with vitamin E and aloe. Protein Infused to strengthen and repair coats. Shake well. Spray on dry or wet coat 4-6 inches away from coat. Comb or brush thoroughly for maximum coverage and penetration into the coat. Repeat as needed. Water, naturally derived gentle conditioners, wheat protein to protect and strengthen coat, soothing agents (aloe, vitamin E), lanolin, ethanol, fragrance.